There are loads of vibration plates to choose from, but today we are reviewing the Bslimmer PLUS (VIEW PRICE HERE!). This is an impressive yet affordable machine that is portable, easy to use and comes with loads of extra perks. Read on to find out more. 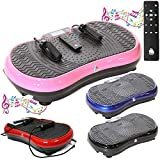 The Bslimmer is a compact machine which comes with wheels on the back of the device that makes it easier to move the vibration plates around your house. This is quite a big perk because you may have to move your vibration plates and/or store them if you are expecting company or simply need some extra space, and so it’ll help if you can actually move the machine around. This will also come in handy when the Bslimmer first arrives and you have to move it into the desired location. 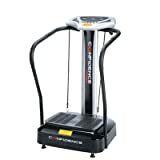 The Bslimmer vibration plates come with 50 speed range levels, which is enough to help you improve gradually over time. When you first start using your Bslimmer you will probably start off on a lower speed setting as you get used to the machine and start trying out different workouts, but as time goes on you will have to increase the speed so you can keep improving and losing weight/gaining muscle. If your body gets too used to your speed level it won’t have to work as hard and then you’ll stop seeing quick results, so it’s important to invest in a product that you can use in the long term. The Bslimmer also includes several workout programs that are tailored for specific goals I.e weight loss or muscle gain. The Bslimmer comes with a fully functioning LED screen that will let you select the workout program you want and will show you the time and speed of your workout. The screen is a big part of any exercise machine because it helps keep you motivated. When you are working out (especially when you are alone) you may find it hard to stick to your goals and you may lose track of time and so stop your workout early. These screens help keep you motivated and allow you to easily control your vibration plates via simple buttons. 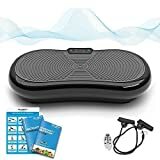 The Bslimmer comes with a free workout DVD that features a variety of exercised for different fitness levels and different parts of your body. When you’ve just started working out it can be hard to develop a productive and effective routine, but luckily this DVD will help you target the parts of your body you want to work on and will give you loads of options to play around with as you improve. This machine also comes with a remote control, free power cords and detachable support bars. The support bars will help you feel comfortable and keep your balance when you’re just starting out, but over time you may want to test yourself and use the vibrating plates without additional support. These vibration plates are easy to assemble and comes with an accessible user manual. The Bslimmers maximum weight is 120kg, so anyone who weighs less than 120kg may use the machine. Summary: Portable – 50 speed levels – Workout programs for different fitness levels – LED display – Free DVD – Detachable support bars – Remote Control. Bslimmer has been making vibration plates since 2004 and so you can trust that they know what they are doing. 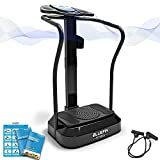 This is an impressive machine for the price and it will let you improve over time, it will help you lose weight, increase your blood circulation and give you additional acupuncture, and it is easy to use and portable. If you are reading this you have probably decided to purchase some of your own personal gym equipment. 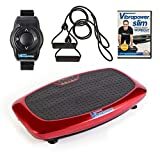 Perhaps you’re already set on buying vibration plates or maybe you’re just shopping around, but either way you should know that vibration plates are a great way of losing weight and gaining muscle without all the pain and strain that comes with many other forms of exercise. Vibration plates are a simple and effective way of exercise, and they require minimum effort on your part. 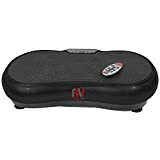 When you use vibration plates they will, as the name suggests, begin to vibrate. These vibrations makes it harder to balance on the machine and so your muscles will have to contract and release in order to keep you steady. You can adopt different positions to work out different areas of your body (and use different workout programs to focus on muscle gain or weight loss depending on your individual goals) and you can increase the speed over time so you continue to improve, but the basic function will remain the same. As this is quite a low impact form of exercise it is great for older people or for those of you who are just getting into exercise. It also comes with a load of extra health benefits including improving your balance, your bone density and your blood circulation. Some ‘massage’ vibration plates also help target acupuncture points in your body which comes with a whole other range of benefits.